We are offering highly reliable Aluminum Scaffolding Services. These services are extensively used in heightened maintenance works for building supports with the combination of ladders and work platforms. We design these services in accordance with clients requirements and provide utmost assurance of maintenance free and high load bearing capacity scaffolding. Our offered services can easily be availed by our customers at the equitable price range. The same can be assembled and disassembled in short span of time - without any tool Kit. Long Lasting – being Aluminum, your tower will never rust. Environmental concerns are minimal as opposfladded to steel scaffolding. 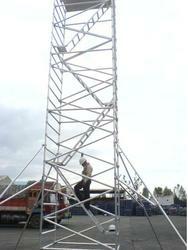 General Life of Aluminum tower is determined by the general use the tower will be subjected to. No Maintenance – An Aluminum Alloy Scaffolding is resistance to rust, so apart from lasting longer, you will not need to maintain the components. No galvanizing, re-painting or expensive exercises for maintenance and repair are ever required. Looking for Aluminum Scaffolding Services ?